These cookies are nutty, slightly chewy, a tiny bit sticky, sweet and salty. Great at room temp or warm, as a pre-workout, or snacking with some friends and a glass of almond milk. These might be one of the best, and easiest to make, healthy cookies! In a bowl, mix together the almond butter, vanilla, egg, and 1 Tablespoon of the maple syrup, until a creamy consistency. Mix in the baking soda and coconut palm sugar. Add the coconut flour and mix until it forms a dough. Roll the dough into 1 Tablespoon balls and flatten. Place the raw cookies onto the baking sheet 1/2 inch apart (they do not expand so don't worry about them spreading into each other when they bake). Sprinkle a little bit of extra coconut sugar on top of each. Place the pan into the oven and bake for 8 minutes. Take out of the oven and let cool for about 10-15 minutes. While the cookies are cooling, melt together the other 1 Tablespoon of maple syrup and the coconut oil. Drizzle the maple coconut mix over the cookies and then let them cool down for another 3-5 minutes. Last sprinkle a small amount of Himalayan pink salt on top of each cookie. Indulge in the sticky cookies or store in an air tight container. Overnight, or after at least 6 hours of the cookies cooling in their container, the cookies will soak up the maple syrup and the coconut oil will harden onto the cookies, making them no longer sticky. If you plan on enjoying these cookies and do not want to have to lick your fingers or use a napkin afterwards, I recommend eating them the following day. 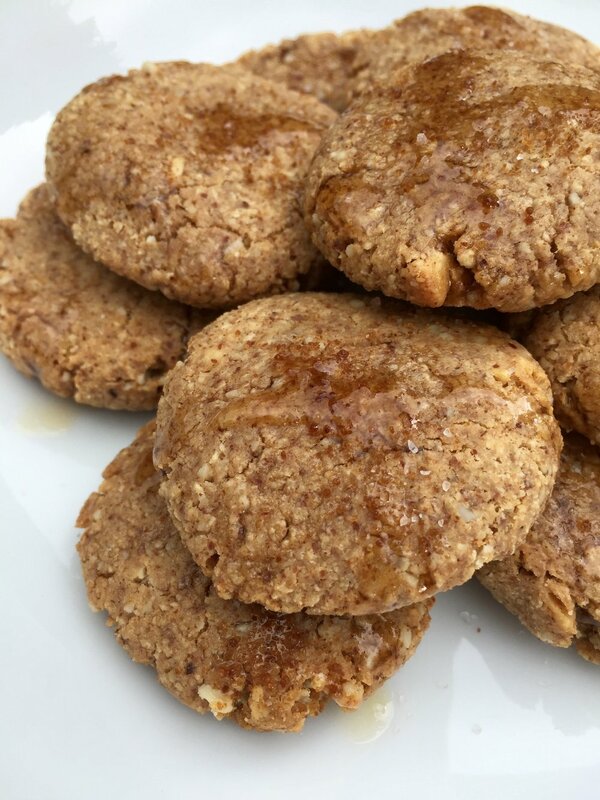 If you like the sticky, just rewarm another mix of maple syrup and coconut oil and drizzle more over the cooled cookies before enjoying. Creamy and/or unsalted almond butter works for this recipe too. If the almond butter is not salted, then just add 1/2 teaspoon of salt to the mix before baking (in step #2). Also, any other nut butter works instead of almond butter.